2017-18 Upper Deck Series 2 Hockey gives NHL collectors a second shot at the standouts of the league. The Young Guns rookie cards average six per hobby box, and fans can also look forward to OPC Update, UD Canvas, and Portraits inserts in every box. Per usual, the stars of the 2017-18 Upper Deck Series 2 Hockey checklist are the Young Guns rookie cards, this time led by Nolan Patrick and Clayton Keller. Extending from UD Series 1, the 250-card set includes 200 base cards and 50 new Young Guns (1:4 packs). These have the customary UD Exclusive (#/100), High Gloss (#/10) and Printing Plate (1/1) versions, along with hobby-only Clear Cut parallels for both base subjects (1:90 packs) and Young Guns (1:360 packs). 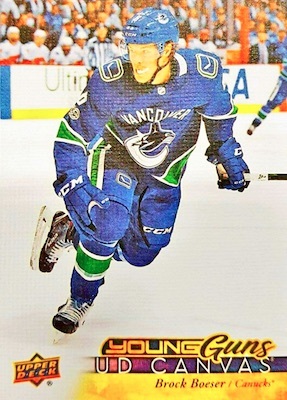 2017-18 Upper Deck Series 2 Hockey also adds new UD Canvas cards, which combine to fall 1:6 packs. The Canvas pack odds are further broken down as follows: Base (1:7), Young Guns (1:48), Team Canada Program of Excellence (1:192), and Retired Stars (1:192). 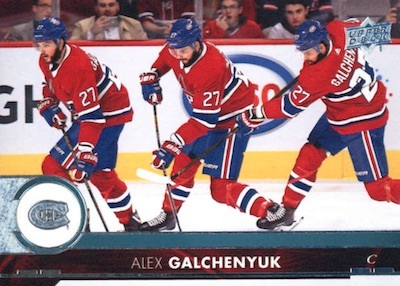 Hits are slightly more rare in 2017-18 Upper Deck Series 2, but not impossible. 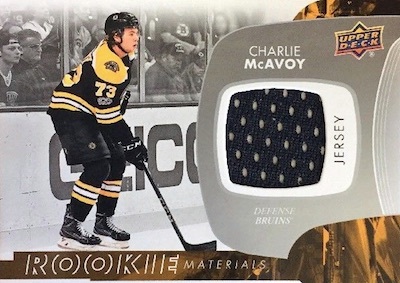 The main Rookie Materials (1:48 packs) jersey cards have numbered Patch (#/25 or less) parallels, while 1,000 Point Club (1:864 packs) comes with select memorabilia pieces. In addition, there is a special UD Canvas Signatures card for Steve Yzerman that is numbered to just 19 copies. The Series 2 inserts display much more variety, with both rarity and unique looks. UD Portraits has 50 top rookies at 1:6 packs. Additionally, these can be found in Gold (#/99) and Platinum Blue (#/25) parallels. Also for the first-year players, the die-cut Rookie Breakouts (#/100) utilizes acetate card stock. Among the most rare inserts in the 2017-18 Upper Deck Series 2 checklist, Fluorescence showcases Spectrum Light FX technology for colored versions like Gold (#/150), Blue (#/50), Green (#/10), and Magenta (#/5). 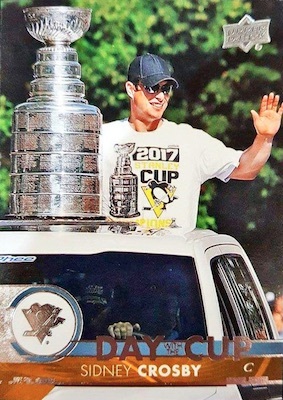 Celebrating the Pittsburgh Penguins as Stanley Cup champions, the Day with the Cup SSP is back at 1:1,000 packs. 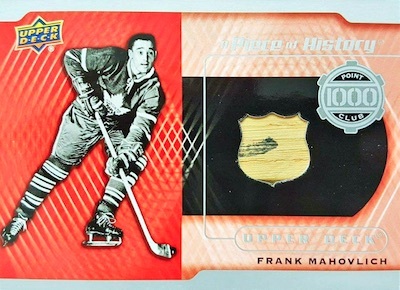 In addition to updating the first series of the flagship NHL set, 17-18 UD Series 2 is also the place to find updates for 2017-18 O-Pee-Chee. Options consist of the main OPC Update, as well as Retro, Rainbow Foil, Black Border, and finally, Red Border, which is exclusive to hobby formats. Odds Key: h=hobby; e=ePack; r=retail, b=blaster, t=tin, f=fat pack. 200 cards. Shop base sets on eBay. Numbering picks up from Series 1. PARALLEL CARDS: Clear Cut (1:90; hobby only), UD Exclusive #/100 (h/e), High Gloss #/10 (h/e), Printing Plates #/4 (h/e). 50 cards. Shop full Young Guns sets on eBay. Young Guns odds - 1:4 hobby/ePack/retail/tin/fat; 1:6 blaster. See the complete Young Guns gallery. PARALLEL CARDS: Clear Cut (1:360; hobby only), Exclusives #/100 (h/e), High Gloss #/10 (h/e), Printing Plates #/4 (h/e). Unannounced SSP. Let us know if you spot any others. Shop on eBay. Card features original YG number from initial release. 150 cards. Shop S2 Canvas cards on eBay. Base odds - 1:7 hobby/ePack/retail/tin/fat; 1:14 blaster. Young Guns odds - 1:48 hobby/ePack/retail/tin/fat; 1:96 blaster. Retired Stars odds - 1:192 hobby/ePack/retail/tin/fat; 1:384 blaster. POE odds - 1:192 hobby/ePack/retail/tin/fat; 1:384 blaster. 1 card. Hobby and ePack only. 2 cards. Hobby and ePack only. Overall odds - 1:864 hobby/ePack. Odds - 1:1,000 hobby/ePack, 1:2,500 retail/tin/fat, 1:5,000 blaster. 50 cards. Serial numbered #/150. PARALLEL CARDS: Blue #/50, Green #/10, Magenta #/5. Odds - 1:6 hobby/ePack/retail/tin/fat; 1:12 blaster. FOIL PARALLEL (h/e): Gold #/99, Platinum Blue #/25. 30 cards. Serial numbered #/100. Overall odds - 1:48 hobby/ePack/retail/tin/fat; 1:480 blaster. 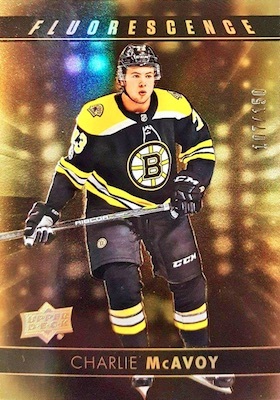 PARALLEL CARDS: Patch #/25 (No Jake DeBrusk*). Nico Hischier/Nolan Patrick Patch parallel #/10. Numbering continues from main OPC set. BASE OPC PARALLELS: Rainbow Foil (1:120 h/e/r/t/f; 1:240 b), Red Border (1:1,230 hobby), Black Rainbow Foil*, Retro Variant (1:60 h/e/r/t/f; 1:120 b). 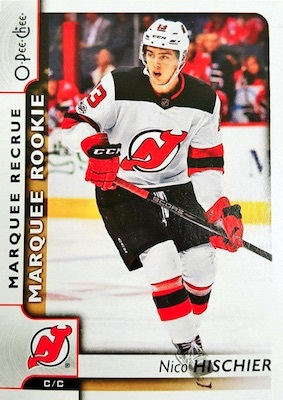 MARQUEE ROOKIES PARALLELS: Rainbow Foil (1:30 h/e/r/t/f; 1:60 b), Red Border (1:307 hobby), Black Rainbow Foil*, Retro Variant (1:15 h/e/r/t/f; 1:30 b). One 3-card OPC Glossy Rookies pack per Mega Box. PARALLEL CARDS: Gold Foil (1:4 packs), Red Foil (1:18 packs). View the 2017-18 Upper Deck Series 2 Hockey checklist spreadsheet. Looking forward to the OPC updates. I am a collector on a budget and try to stick to the low end releases like OPC, MVP, Parkhurst, etc. I was glad Upper Deck woke up and realized not everyone wants to spend big bucks on cards and brought back Parkhurst last season and numbered the OPC updates as a part of the base set and not a subset like they did for the past few years. Would like to see them make a MVP update set also instead of making collectors find insert redemptions. Its a down year in terms of cant miss rookies compared to the past few seasons but that’s to be expected with a weak draft class and no cant miss prospects like McDavid or Mathews rookies to search for. I for one am pretty stoked about S2, and fully agree with JC about the rookie class this year. I’m definitely going to be making a few YG sets and setting them back. S1 has MANY rookies that are solid now and many more that I foresee having long productive careers, S2 should have just as many! Keeping my fingers crossed for KOSTIN, LGB! If somebody watches a LOT of Casebreaks (has to be whole, Sealed Cases), and keeps an accurate track of how many Fluorescence Cards out of /150 are opened in those cases, then we can get a fairly accurate guess as to how many cases of this stuff was made. Has anybody counted how many different cards in the entire production. No kidding I’m sure that even Donald Trump would be unable to complete the entire production. Quick question, I know clear cuts are only in the hobby packs. Are the Exclusives and High Gloss only in hobby packs too ? Exclusives and High Gloss are found in hobby and ePack, which is why they are noted as (h/e). is opc update part of this set because the cards are in the boxes or is it a subset of opc? OPC Update is an insert set found in boxes of Series 2 that extends the checklist numbering from the earlier O-Pee-Chee. Looks like a lot of unannounced inserts to come (based listed sets this year vs prior). Also interesting that they chose to make a YG of Robbie Russo over Martin Frk for the Red Wings. Seriously what happened in the regular set player selection? No Drew Doughty, Mats Zuccarello, Joe Pavelski, John Klingberg, Jacob Silfverberg, Justin Faulk, Patrik Hornqvist, Nick Leddy? Who made the player selections? How can anyone supposedly know hockey & miss these players? Please someone pass this on to Upper Deck. Trey, are there Acetate Young Guns in this product? Or just Clear Cut Young Guns? I thought that Acetate Young Guns were only in SP Authentic? Has UD split the Acetate Young Guns into different products in prior years? Series 2 has Clear Cut for sure. Last year, SP Authentic had the Young Guns acetate variations. Because Upper Deck doesn’t actually release the full checklist, regularly leaving their “Easter Eggs” off the spreadsheet, we won’t know for sure until cards begin to surface. 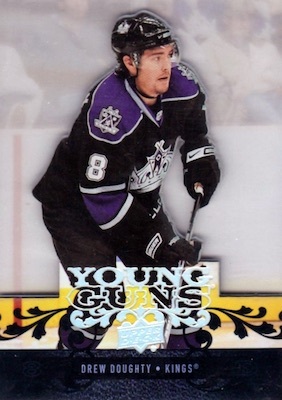 What are the odds of a young guns Acetate in UD series 2? UD has also released yg acetates of older players in this product. So far I’ve seen a kessel and doughty pulled yg acetate pulled. I purchased 3 boxes today. One was average. The first one I opened, I actually posted on You Tube. It was a super box. Still have to open the third box but that was crazy. I did open a Series 1 box at the Toronto Expo and had the Charlie MacAvoy and Nico Hischier young guns in that box. Noticed on Ebay a redemption card for 50 O-Pee-Chee black foil /100 rookie card set. Not sure what the odds are or if there is just one. 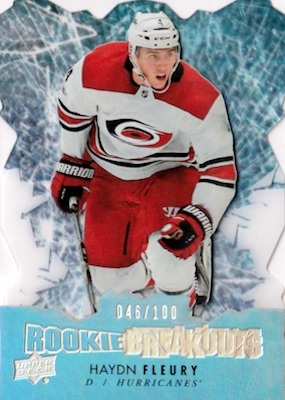 Frk had a rookie card last year with the Hurricanes, no point in adding him to the young guns set. No autos or veteran UD jerseys in this product? Interesting, was gonna bust some but ill have to pass with the less is more approach. Just scored a redemption black rainbow set. The only case i bought. Just put it on eBay. What s something like this worth? Disappointed they didn’t continue the Centennial Standouts set from Series 1. Disappointment seems par the course with Upper Deck releases these days. The portraits are a dud and should be discontinued as an insert..hmm why not replace them with something more appealing like some Legends. Dream on.. 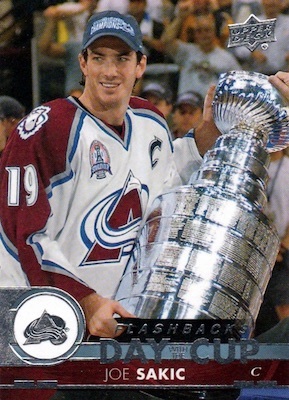 The Retro cards show their original Young Guns number, so overlap is possible. Justin Kennedy, what do you think will sell more packs? A subset with (only) Rookies in it, or a subset with (only) Legends in it. I am guessing the Rookies win it. You might not like the Portraits subset (nobody likes every subset), maybe they could tweak it a bit to make it more exciting? I pulled a Patrick Roy DWTC Flashback on my first ever hobby box (feeling insanely lucky). The card is DCF-2 just to let you know. ^^^^^ Def want to know this on the 300 Win Set. If you notice, they have “Series 1” on them so the production may have been out of whack. They could also be held back for ePack. I’ve tweeted this to UD, no answer. There are 2 Phillip Danault cards in this set. One in series 1 (card 105), and one in series 2 (card 352). This is an unnecessary duplication. They could have added another player, that didn’t already have a card in the set. In Series 1, the veterans have Gold parallels that are numbered to 25. You are saying you have four UD Portraits cards from Series 2 (#P-61 to P-110) that feature Gold parallels numbered to 25 rather than 99? Every year, I break a hobby box or two of this stuff and somehow, I always seem to end up with the dud. No notable YG’s, no #’d cards, no unannounced inserts, no YG Canvas (or any Canvas SP’s), no clear cut parallels, no SP cards (like day with the cup). Nothin. Best card was a rainbow OPC vet card. I’d be lucky to get $20 total for the garbage I found. Left such a bad taste in my mouth that I will not touch this stuff again with a 10 foot pole again. Judging from the above comments, I must be in the small minority. With all the inserts and crap, they could at least throw a case hit in every box (instead, they throw “hot boxes” together) but this is 2018 and someone always has to get left out. When it’s me, I’m out for good. I ended up throwing the whole pile into the garbage as it is not worth my time to list on eBay or enter into my inventory. Retro Young Guns rock. Fluorescence is meahhh. A too childish design. The Rookie Breakouts look really good. 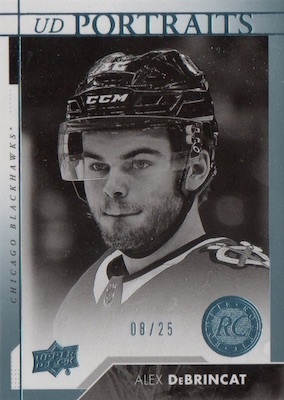 Besides that, a normal UD Series product…3 stars from me because they screwed the lightning in the Rookie Portraits pictures and the image is very dark. For $50 a box at my trusted local dealer I always enjoy cracking a couple open . The Young Guns class is weak and I have a glut of OPC Update Rookies as expected. My enjoyment comes from the Acetate, High Gloss and Exclusives parallels as well as some of the Rookie canvas. Early on I pulled the Scheifele Retro Young Guns acetate, which I helped add to your list. 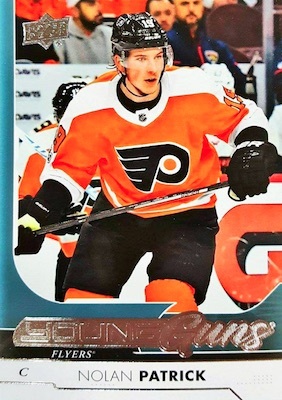 I have to let you know I bought a single box the other day (more fun than scratch tickets) and pulled not only the Sidney Crosby Retro Young Guns # 201. The same box had Ryan Nugent-Hopkins as well. True definition of a “Hot” box. My question regards the OPC Update Retro blank backs. I pulled # 601 Marc-Andre Fleury and didn’t realize until I went to scan it. Has OPC ever released any information as far as the odds and print runs ? I used Google and came up with nothing. Hoping you could help. UD rarely discloses print runs or odds for the unannounced additions. 2017 18 UPPER DECK SERIES 2 HOCKEY HOBBY BOX FREE PRIORITY SHIPPING SEALED LIVE!